You've seen the teaser for Kia's first Super Bowl commercial, right? We've seen the whole thing. Sorry, can't link until it airs during the third quarter. It's not bad. It's fun. But it's really just a longer version of the teaser. No real surprises. Well, except for maybe a lady wearing a yellow bikini in a hot tub. You know. These are the things marketers have to do to appeal to the stereotypical block head who watches the Super Bowl, right? But the ad does end with a focus on family. No, not that kind of focus. Love a good (that's a relative term, of course) Groundhog Day joke? You might like this new Grey-created commercial for truTV which hypes its NFL Full Contact series premiering the day after the Super Bowl. 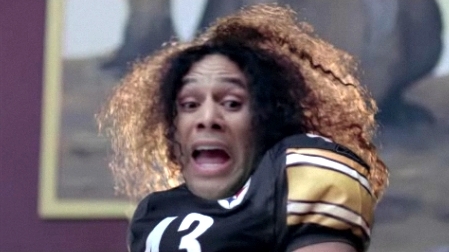 In the ad, Pittsburg Steelers' Troy Polamalu is pulled from hiding. He sees his shadow and it is proclaimed there will be six more weeks of football. Kinda funny but we're not too sure how well a Groundhog joke will go over after Groundhog day. After all, we are a country that's all about anticipation and lead up. Christmas stuff hyped before Thanksgiving. Valentines Day hyped before New Years. Back to School hyped the days the kids get out for summer. Watching this commercial is going to make people wonder how many months ago they saw Puxatawney Phil. Anyway, look or the commercial in the second quarter just before the two minute warning. Oh my God. No, really. Oh my God! This is the most beautiful commercial I have ever see. While many "drive safely commercials" tug at your heart strings with death, dismemberment and the emotional aftermath of a car accident, this one from Sussex Safer Roads entitled Embrace Life tugs in an entirely different way. Equally powerful as the death and dismemberment approach to safe driving, this particular commercial brings a tear to the eye in appreciation of life, love and the importance of family. And yea, the importance of wearing a seat-belt as well. Wow. I've watched it ten times in a row and it still gets me. How'd we miss this one? A fire breathing goat that shits money? Must still be hung over from Vegas. Oh well. This "new" commercial from BBDO Atlanta for the Georgia State Lottery has fun with animals. Goats, specifically. Goats that breathe fire and leave steaming piles og cash on the floor. Crazy? Weird? Strange? Wrong? According to AdFreak, no. They write, "The Georgia Lottery is the only lottery in the U.S. to enjoy 11 consecutive years of increased profits, so BBDO must know what us Georgians like." Indeed. - Obama's State of the Union address was promoted with ads on Google. - Here's Boost Mobile's four :15 teasers which begin airing on ESPN, TBS, Comedy Central, MTV and others. Full ads will debut during the Super Bowl. - Here's a Spanish version of the U.S. Census Bureau commercial. It's from advertising agency GlobalHue Latino and production company Shilo. - AutoMD is a new social network focused on all things auto repair. Give a read and...learn how to get that dent out of your door? 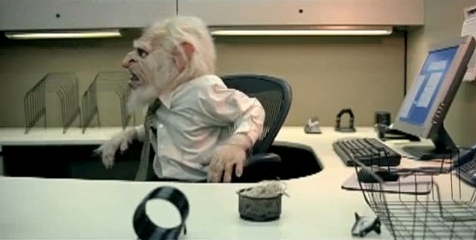 If this commercial is to be believed, Monster really is the best job service out there. After all, if it can place a terrorizing boogey man into a CPA position just think what it can do for us humans. Just don't let the National Association For the Ethical Treatment of Boogey Men see this commercial. They will be outraged. Outraged we tell you! And no, the whole monster using Monster concept wasn't lost on us. Kind of a boring ad but if you're into Brett Favre, you might like it. It's from Y&R Chicago and it's for Sears and is pushing TV set sales. It features the football star in a Sears television showroom bantering with a salesman. A little joke is made and that's it. Nothing special. But, as we approach playoff weekend and the Super Bowl, it kinda resonates. More ads will follow this weekend. Leading up to the game in Miami, consumers can visit Sears Football to vote for their favorite Brett Favre TV ads and enter to win a gift card as part of the TV MatchMaker sweepstakes.